Disclosure: The Counter provided me with gift cards to enjoy a meal for the purpose of this blog post. I happen to love The Counter, so I jumped at the chance! I’m what some people may consider a picky eater. I’m very particular about what I like and don’t like, and that coupled with the fact that I haven’t eaten beef or pork for 20-something years makes me the person no one wants to share a meal with (or the person the chef hates). 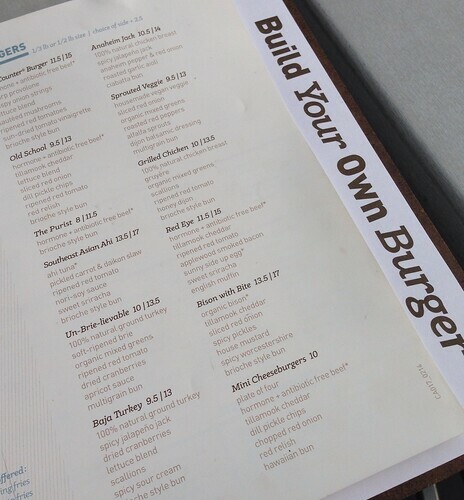 Fortunately, there are restaurants like The Counter, where you are encouraged to build your own burger, rather than get shamed for making substitutions! And I’m lucky that there is a location walking distance from my apartment, so it’s a great local place to meet up with friends. Two quick things first: 1. They have two hours free parking with validation. This is a rarity in Hollywood, so it’s a huge plus for friends that don’t live as close as I do. 2. I just discovered they have sangria. Need I say more? Anyway, for those of you who want to order off the menu, there are a bunch of new delicious Expert Builds menu items to choose from the next time you’re there! My friends and I used the new menu items as inspiration for our dinner choices, and we all loved our meals. The counter has a wide range of protein options (beef, turkey, bison, tuna, and chicken), as well as a veggie burger for those that don’t eat meat, so we did a little swapping and were super satisfied. I had the Anaheim Jack with turkey rather than chicken, and it was delicious. 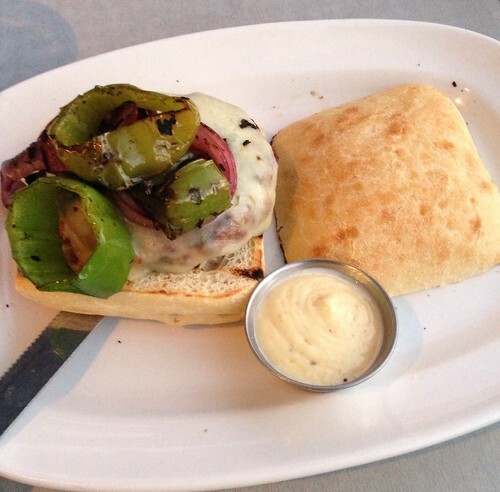 I loved the spice from the jalapeno jack, and the garlic aioli was divine. And they sure don’t skimp on the peppers! One of my friends had the Un-Brie-lievable over lettuce instead of the bun, and swapped the turkey burger for a veggie burger. She said she was pleasantly surprised at how well the brie and cranberries went with the tomatoes. Two thumbs up! Side note: Isn’t it pretty? 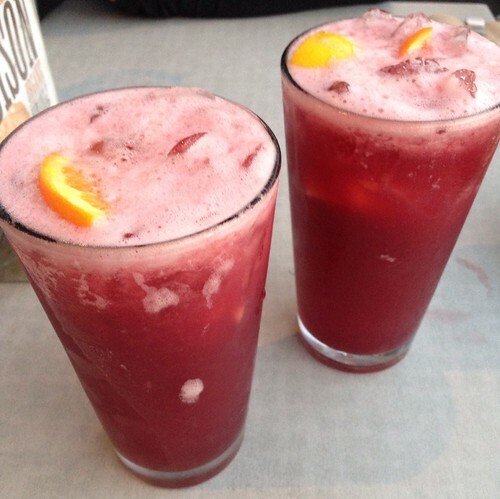 Of course, we also enjoyed some sangria, because well, it was 70 degrees out and…sangria! And a trip to The Counter isn’t complete without an order of fries. We went for the fifty-fifty with sweet potato and parmesan fries; the sweet potato were our faves. 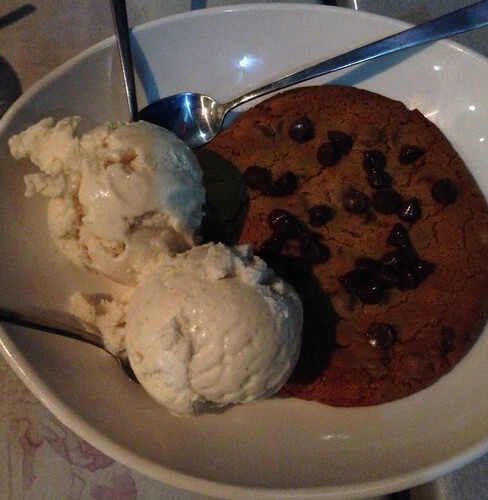 Just when we thought we couldn’t eat another bite, we decided to order the oversized chocolate chip cookie a la mode with three spoons. I’m a sucker for a warm chocolate chip cookie with ice cream, and I wasn’t disappointed. We ate every single bite! Jealous yet? Don’t be! 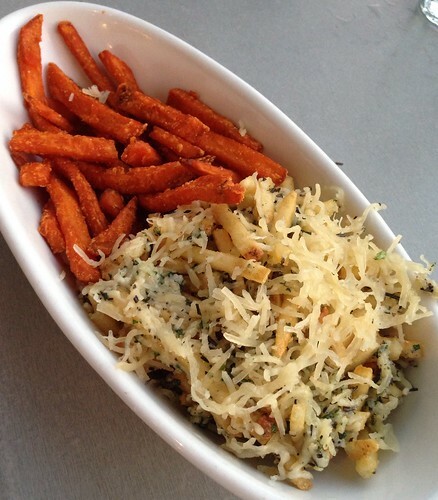 The Counter is also providing one lucky blog reader with a $25 gift card, so enter below! I’m confused about how to enter, but I’m leaving a comment because YUM. @Elise – Hah! And I thought Rafflecopter made it easier. Click on one (or all) of the options! The Counter is one of my faves. Also, the beer selection is TOP NOTCH. 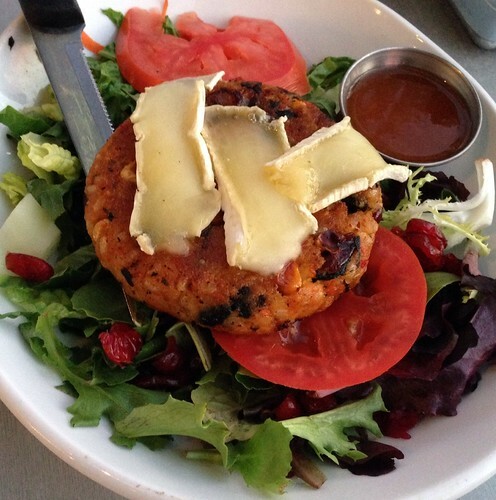 I would very much like to try that Turkey Burger Brie Thing. Please pick me. Thank you. The Sprouted Veggie sounds like my kinda build! YUM! I can’t wait to try the Un-Brie-lievable… thanks for the info. YUM!! I haven’t been to The Counter in at least 2 years. The new additions sound–and look–amazing! That sangria looks refreshing! Gotta try it soon! I was going to put in some snide comment about entering even though the restaurant is in California, but then I saw that they have a store in Virginia close to me. Spiked shakes sound good! Incredible! It’s perfect for Fathers day..